Famous boy wizard Harry Potter and many of his friends (and enemies) will be making two visits to Canolfan Beaumaris on Wednesday 8th October. The very funny TV double act of Dan and Jeff take on the ultimate challenge and attempt to get through all seven Harry Potter books in seventy minutes in their acclaimed show Potter Potter. With the help of endless costumes, brilliant songs, ridiculous props and a generous helping of Hogwarts magic, the show will feature everybody’s favourite characters. A special appearance from a very frightening fire-breathing dragon and even a game of Quidditch involving the audience is also promised. The show is being organised by the Iorwerth Rowlands Community Project, based in Beaumaris who are thrilled to be bringing this acclaimed show to audiences on Anglesey for the first time. 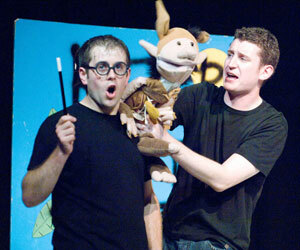 Potted Potter was written and created by comedy performers Dan and Jeff who have been widely featured on television including Blue Peter and the Richard and Judy show. Following sell out seasons in the west end of London and at the Edinburgh Festival they are visiting Canolfan Beaumaris as part of a tour of Wales organised. Funding is provided by the Night Out community touring scheme from the Arts Council of Wales in partnership with Anglesey County Council. There are two performances of the show on the 8th October. The afternoon performance kicks off at 1.30pm with the evening fun starting at 7pm. Audiences members are encouraged to dress up as their favourite magical or Muggle character for the performance. A door prize will be offered for best costume. In conjunction with the show, Canolfan Iorwerth Rowlands Project are also running a poster colouring competition for local children.